Coronation gun salute, The Forest, 1937. During the First World War (1914-18), Nottingham’s parks hosted fundraising band concerts for causes such as English prisoners-of-war held in Germany and wounded soldiers. 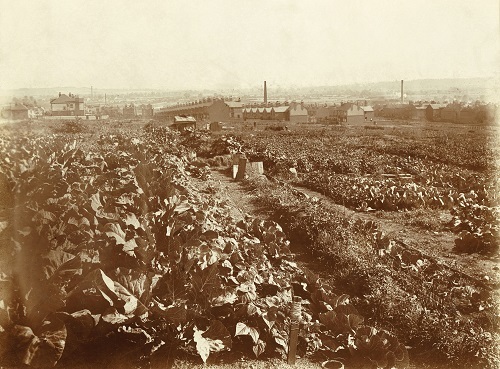 The Forest was used for military parades, inspections and bayonet practice, while several parks and green spaces were cultivated for food production. But in some ways, life in the parks remained much as it had before. Cricket and football pitches continued to be used, especially on The Forest – although teams sometimes consisted entirely of military personnel. Misdemeanours and illicit behaviour still occurred, and the penalties could be harsh: in 1915, one man tried to steal coins from the penny slots in The Arboretum lavatory doors, and was sent to jail for six months. At the onset of the Second World War (1939-45) Goose Fair was cancelled, as it had been in the First World War. Tracts of land on The Forest, and in other public parks in the city, were dug up for food production. In some parks, bomb shelters were erected. By mid-1942, the tide of war was beginning to turn in the Allies’ favour and the parks hosted summer Holidays-at-Home activities, including dance bands, theatre performances and a daytime only Goose Fair in August. 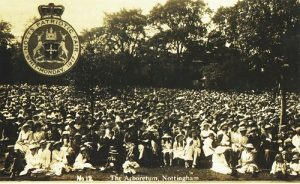 Nottingham Patriotic Fair, Whit Monday, The Arboretum, 1917. Food production on King Edward Park, Carlton Road, c1915.